Yeah, that's a little mushy, but it's cool. Because we live in different cities, we can really only see each other on the weekends, which is tough when it comes to the love of your life. I mean, come on! Anyway, even a little thing like infectious illnesses won't keep us a part; I've been sick and coughing for about three weeks now, and he's been toughing out the worst of it lately. But we've made the best of our long weekend, staying in pretty much ALL DAY, playing games, watching Star Trek, reading... and I guess not much else. All in the pursuit of rest and health, of course... er, at least we made our Sunday cocktails with a sense of healing, kind of. For Caleb's rough cough, I made him a honey-lemon hot toddy, and for me, an amped up, Vitamin-C rich orange dreamsicle. 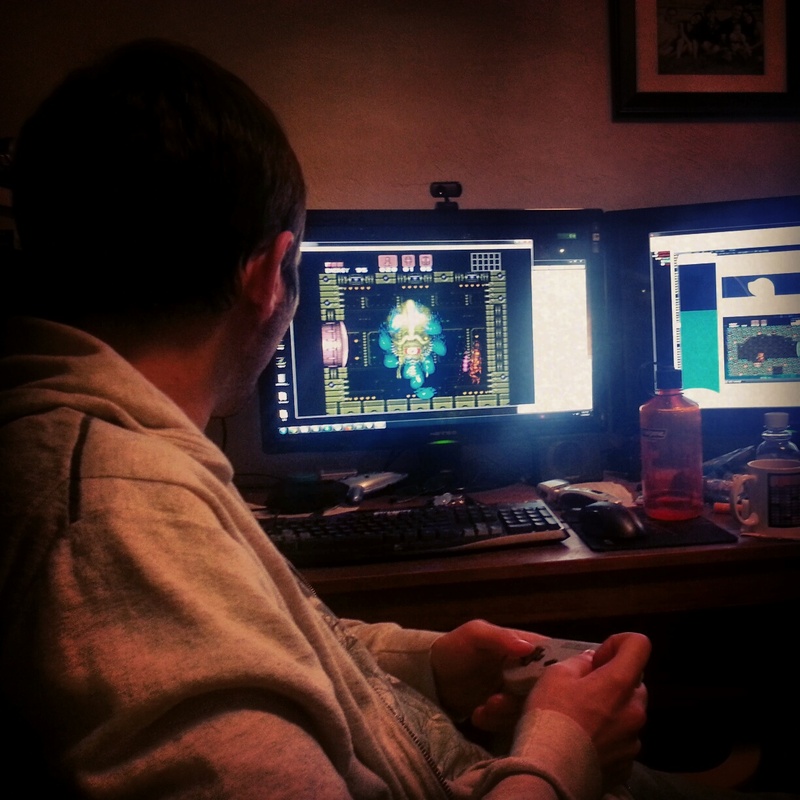 Caleb working on his Phantoon battle in Super Metroid... a surefire way to get over a nasty cold. You can kind of see the mug of his yummy hot toddy in the far right. Today, continuing our hermit marathon, I made us some Sunday cocktails while I read and had snacks, and he played games. Make sure your hot water is hot. Caleb has a kettle at his house, so I just boiled it to bubbling. Meanwhile, I poured one shot of whiskey into a mug, then squeezed half a lemon into the mug. Tip: Squeezing a lemon to get juice is easiest if you prime the lemon before going out at it. Before cutting the lemon, roll it under your palm on a cutting board or a counter. This will help loosen the pulp from the rind and make the seeds easier to pick out. I used a spoon to scoop out some of the lemon pulp into the cup also (lemony is good). Then also scoop a generous helping of honey into the mug. I pour a little of the hot water over the spoon to get the honey off before I add another scoop so Caleb can get max honey to lemon/whiskey. Pour hot water into the mug to full, stirring to melt the honey and combine the water, whiskey, and lemon. Hot toddys are awesome for keeping warm. 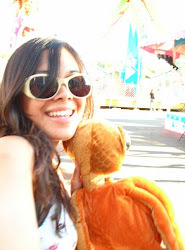 My first year in Oregon, I lived in a basement apartment with no heater and windows that never fully shut. I was broke, but I could afford one good bottle of Dewar's White label and lemons and honey. I swear I survived the winter by the grace of hot toddys alone. Of course this recipe can be made completely without the alcohol, which is honestly much better for a cold. Alcohol can dehydrate your body, which is not so good when your body is fighting desperately to get rid of an infection, like a cold. Honey, lemon, and hot water alone are wonderful for colds, it's a recipe my mom and probably everyone's mom or dad has made them at one point to soothe a sore throat. According to the Mayo Clinic website, drinking fluids including lemon and honey can help keep your body hydrated and loosen congestion. 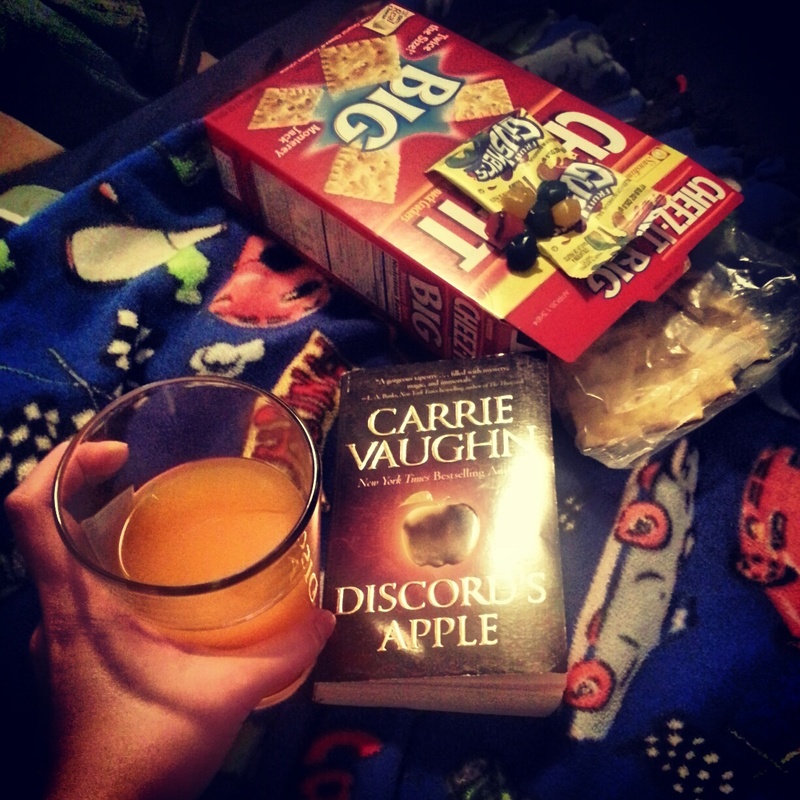 Juice, fruit snacks (for the vitamins, of course) crackers, and a fun book. Measure out the vodka into a shot glass (I used about 1 full plus one half shot glasses of vodka) and pour into the pint glass. Pour juice into the pint glass until full. Stir and then guzzle! This is such an easy drink to make. Seriously. Caleb actually went to school to learn how to mix good cocktails, and I just go into the kitchen and am like, yes, 2 ingredient drink, right on! Instead of regular orange juice, I used Earthwise Orange, Carrot, Mango juice. It made the drink have a little more complicated flavor, although it was crazy sweet! So, again, alcohol really isn't very good for you when you're sick. But I've been "sick" for so long now, I kind of don't care. And I'm totally functional, anyway. But if you are sick, you should stick with the juice sans vodka. I am a juice fiend, actually, so I get plenty of non-alcoholic juice throughout my day regularly. Try to always drink 100% fruit juice rather than "fruit juice cocktails" (which often include many different kinds of juice to make up the flavor of one fruit, as well as add a lot of high fructose corn syrup, which... why?). Of course, 100% real fruit juice is often very rich in vitamin C, a nutrient that is essential to fighting infections and overall good health! Here's to healthy days and warm winter evenings with something yummy in your mug or glass!